A woman who wants to divorce her husband on the grounds she is unhappy has lost her Supreme Court appeal. Following the ruling, the Ministry of Justice said: "The current system of divorce creates unnecessary antagonism in an already difficult situation. 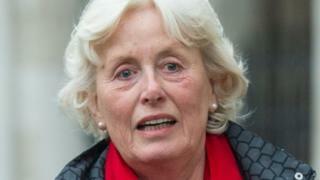 Mr Owens, 80, has refused to agree to a divorce and denied Mrs Owens' allegations about his behaviour. He said if their marriage had irretrievably broken down it was because she'd had an affair, or because she was "bored". Supreme Court justices analysed rival legal arguments, which revolved around concepts of "unreasonable" behaviour and "fault", at a hearing in May and delivered a ruling on Wednesday. One, Lord Wilson, said justices had ruled against Mrs Owens "with reluctance" and it was a case for Parliament. A statement made by Mr Owens' solicitors said he should not be "unfairly criticised for attempting to save his marriage". "Hugh Owens takes no pleasure from this process which has impacted on the private family life of him and his wife," the statement said. Simon Beccle, Mrs Owens' solicitor, said she had hoped the justices would make a decision which would be "forward-thinking and fit with the current social mores". The original judge who heard the case found the marriage had broken down, but that Mrs Owens' examples were "flimsy and exaggerated". Caroline Elliott, a partner at law firm Shakespeare Martineau, said: "England and Wales currently lag far behind other countries with their divorce laws and there is a strong mood for reform, which includes the introduction of 'no-fault' divorces." Rarely in the field of Supreme Court judgements has a ruling been given with such misgivings by so many. Lady Hale, the court's president, called it "a very troubling case". Lord Wilson and Lord Mance shared "uneasy feelings". Why? Because there is deep disquiet about a law that forces spouses to assign blame in order to get their divorce. Many believe blame only exacerbates the problems and conflicts inherent in what is already a difficult and stressful process. There have been calls for a move to a "no-fault" system for decades, like those that exist in the US, Australia and Scotland. A private members' bill has been introduced into Parliament by former family judge Baroness Butler-Sloss, seeking a review of the current law. However, there is little immediate chance of change in England and Wales. Mrs Owens' lawyers had suggested a "modest shift" of focus in interpretation of legislation was required. They argued she should not have had to prove Mr Owens' behaviour has been "unreasonable", only that she should not "reasonably be expected" to remain with him. Nigel Dyer QC, who led Mr Owens' legal team, disagreed and raised concerns about the introduction of divorce on "demand". One Supreme Court judge said she reached her conclusion with "no enthusiasm whatsoever" but that Parliament would have to decide whether to introduce "no-fault" divorce on demand.